Select your course to start! Before registering for this course, students take a written and oral level test. Students first take the written portion online and send us their result by email at the end of the test. After taking the written portion online, students come in to the school for the oral test and to register. Level test location: c/Diputació, 279, Bajos. Monday – Friday 10h– 20h: No appointment necessary. Monday – Friday before 10h or after 20h: Contact us to schedule an appointment. AGOSTO, PRUEBAS DE NIVEL ORALES SÓLO CON CITA PREVIA. Contact para pedir cita. 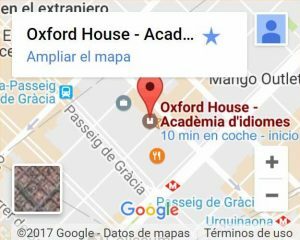 Si ya has completado la prueba online, envíanos tus datos y el horario en el que quieres pasar a tomar la prueba oral. There's no need to fill out our registration form. Simply pay the course fee at the school or online with your card to reserve your place! No level test is required for this course. To reserve your place, complete your registration and pay the course fee online or at the school. Please review our terms and conditions before enrolling online. Students take a level test before registering for these courses.The level test for Cambridge courses has two parts, oral and written, and lasts one hour. These tests may not be taken online, only in the school. After taking the test, students may register at reception. Monday – Friday 10 – 20h: No appointment necessary. You can also send your information now, via our online form, along with the time in which you would like to take this test. Students take a level test before registering for these courses.The level test for IELTS courses has two parts, oral and written, and lasts one hour. These tests may not be taken online, only in the school. After taking the test, students may register in the school. You can also send us your information now, via our online form, along with the time in which you would like to take this test. Students take a level test before registering for these courses.The level test for Cambridge courses has two parts, oral and written, and lasts one hour. These tests are not taken online, only in the school. After taking the test, students may register at reception. Monday – Friday before 10h and after 20h : Contact us to schedule an appointment. You can also send us your information now, via our online form, along with the time you would like to take this test. Visit us at the school or use our online form to let us know your preferences. Then we will get in touch to finalize the details of your classes. A written level test of about 20 minutes is required for students between 8 and 11 years old, except if they have studied at Oxford House before. Students take the quiz online and send us their result by email before coming in to school to register. If your child has studied with us before there’s no need to fill out our registration form. Simply pay the course fee at the school or online with your card to reserve a place! Visit us at the school or use our online form to let us know your preferences. Then we'll get in touch to finalize the details of your classes. A written level test of about 20 minutes is required for students between 8 and 17 years (not necessary for OH alumni). Students take the quiz online and send us their result by email before coming in to the school to register. There's no need to fill out our registration form. Simply pay the course fee at the school or online with a card to reserve your place! Please take the online level test to get a better idea of your level before registering. To reserve your place, complete your registration and pay the course fee online or at the school. You will need to take an oral and written level test to determine which level of the GESE you should take. After taking the written portion online, students come to the school for the oral test and to register. Monday – Friday 10 - 20h: No appointment necessary. No level test is required for this course but you may wish to take the online level test to get a better idea of your level before registering. There's no need to fill out our registration form. Simply pay the course fee in at the school or online with your card to reserve your place! Please complete our online form to let us know your preferences. We'll get in touch to finalize the details of your classes. After taking the written portion online, students come to school for the oral test and to register. Level test location: c/Diputació, 279, Bajos. Contact us to schedule an appointment. To reserve your place, complete your registration and pay the course fee online or at the school. You need to register online before making any payment. There's no need to fill out our registration form. You can simply pay the course fee at the school or online with a card to reserve your place!